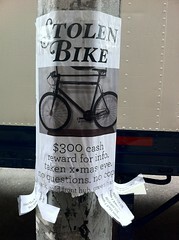 Evan McKnight, who discovered on Christmas Day that his $1,100 bicycle had been stolen from his East 10th Street apartment building, has recovered the bike and will end the year on a positive note – though he’s out $50 that he spent printing “Stolen Bike” flyers plus $40 that had to be paid to the man who returned the custom wheels after seeing one of the flyers posted at a local shop. 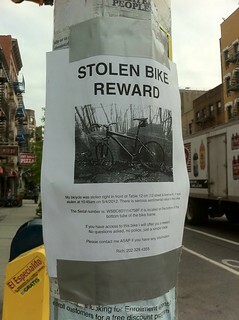 Mr. McKnight said that yesterday evening, a man came into Continuum Cycles on Avenue B to buy a tire tube for a bike he had purchased on the street the previous night. He told the rest of the story in an e-mail to The Local. On his way out of the shop he noticed one of my flyers. He gets home to his new bike and after deducing that he’s in fact purchased a stolen bike from the ‘homeless man’ he decides to bring it back to Continuum Cycles. He speaks with my friend Jeff and tells him he doesn’t want the reward money he just wants his $40 back. Jeff hands it over out of pocket, and sends me a text later that night to let me know he had my bike.